An ultra creamy, healthy, and delicious Spicy Cilantro Avocado Hummus that is vegan, gluten-free, and super quick and easy to make! A healthy and flavorful protein-rich tahini-free Spicy Cilantro Avocado Hummus that is gluten-free, vegan, and super creamy and delicious . . . This is one of those recipes that combines several of my favorite things. There is little to go wrong when you have chickpeas, avocado, and cilantro on one plate -- am I right?! 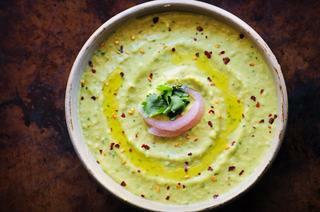 This Spicy Cilantro Avocado Hummus strikes a perfect balance between light and refreshing & creamy and spicy. Delicious a myriad of ways - dip, condiment, salad dressing, over pasta, as a spread, etc. And, can I just add that this dip is divine alongside some cassava or plantain chips? Why, yes it is. Whether you're in need of the perfect appetizer for entertaining or would rather indulge all on your own, I know you'll love this flavorful and fun hummus just as much as we do! An ultra creamy, healthy, and delicious tahini-free Spicy Cilantro Avocado Hummus that is vegan, gluten-free, and super quick and easy to make! In a food processor or high speed blender combine all of the above ingredients.Blend until smooth or desired consistency.Salt to taste.Serve, and enjoy!